Female politicians relate their personal experiences of running for office in a male-dominated political world at Dublin Castle conference. 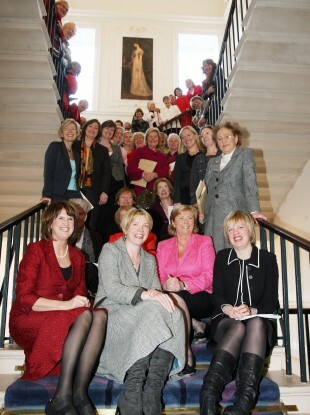 A CONFERENCE HELD yesterday in Dublin called How To Elect More Women? heard that proposed gender quotas in general elections are not enough to get women into power. I think we could all be worse off it it is not taken seriously and women are put forward who don’t have a chance of winning (because of the constituencies in which they are run). The Fianna Fáil senator spoke in a section of the conference in which a number of female politicians from across several parties related their experience of coming to power – and some of the difficulties they had getting there. Power also referred to a remark made by Labour’s Pat Rabbitte about a photograph taken of Fianna Fáil’s new frontbench ahead of the general election last year. At the time, Rabbitte said that Michéal Martin had pulled a “stunt for photographic purposes” by having several women at the front of the photograph. Rabbitte had said: “You might as well wander down Grafton Street and see if you can meet a couple of good-looking women and say, would you ever mind coming up for the photograph, it’s only for four weeks”. Power said yesterday that while she hadn’t experienced “overt discrimination – for the most part” during her time in Irish politics, she did remember that quote from Rabbitte (although she did not name him yesterday). She said that while she didn’t believe he was “inherently sexist”, it was disappointing that the comment has been his “first instinct”. Byrne said that she had been encouraged by the late Jim Mitchell to run for local elections. Her husband had been very supportive but she still remembers rushing home between mayoral appointments to “throw an apple tart into the oven”. It’s a demanding job, you’re on call 24/7, and when I started anyway there was no provision for childcare, no job security and as a rural TD you spend most of the week away from your family. If you didn’t have support at home, you couldn’t do it. I was married 10 months, 9 months pregnant. I met a lady at a door in Booterstown who said: You are a bloody disgrace, you should be at home doing your knitting. In 1975, Dillon Byrne became the first female Cathaoirleach of Dun Laoghaire (equivalent to a mayor) and said that above all, female would-be politicians needed people to support them. When she arrived at the Dun Laoghaire town clerk’s office in 1974, “in Indian skirt, beads and cheesecloth shirt”, and an 11-month-old son in tow, she said the men there were “not happy”. However, the female politicians at yesterday’s conference said that they believed some things were changing on the political scene. Averil Power said it was heartening to realise that more women candidates were not coming from political dynasties and were putting themselves forward because they wanted “to change things instead of writing angry letters”. Power herself said she comes from a council estate in Dublin, and a family who still think she’s “nuts” to be involved in politics. Catherine Byrne said she wanted to be in politics simply because she liked working with people, and Sandra McLellan said she had been a “floating voter” before she got involved in her community and trade union and that had inspired her to run. That’s why there are so many women at the volunteer and community level – they see a direct result for the time they invest… There are some very talented people and we need to introduce a proper local government system. Imagine if you could capture the energy and the imagination available at voluntary and community level and harness that for (district level)? Be sure to sit in the front of the bus and we will achieve equality. In a Q&A session following the segment, Averil Power said that Fianna Fáil would be seeking an amendment to the upcoming legislation to have the 30 per cent gender quota applied to the local elections in two years’ time. It has not been clear that the quota would apply to anything other than general elections. Email “Gender quotas welcome - but 'token' women candidates won't work”. Feedback on “Gender quotas welcome - but 'token' women candidates won't work”.